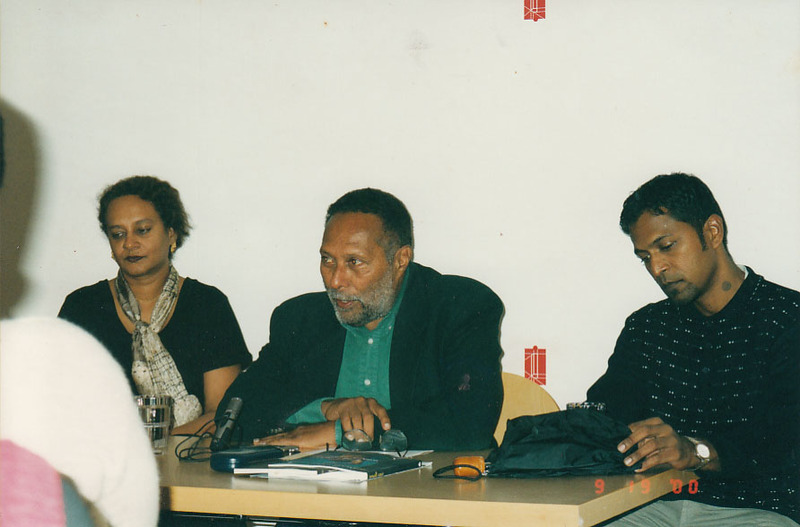 Excerpted from my new blog on EPW’s website…this inaugural post shares memories of Stuart Hall along with some photos. This post was written for the Indian magazine EPW (Economic and Political Weekly), it’s website to be specific, where I’ve been invited to blog. They asked if I would share some of my personal memories and photographs of Stuart Hall in the wake of his passing on Feb 10. The post follows. I found Ranjit Hoskote’s tweet quoted above, worth retailing, because it encapsulates Hall’s vastly influential work most admirably and serves as a suitable introduction to the Jamaican-born thinker the world has been mourning since Feb. 10, 2014. I first heard about Stuart Hall from Tejaswini Niranjana, an Indian scholar who visited Jamaica for three months in 1994. She was a Homi Bhabha Fellow (named after the Physicist not the theorist of hybridity) and had come to the University of the West Indies to familiarize herself with Caribbean culture. Teju was interested in and fascinated by the Indian diaspora in the Caribbean but equally by Jamaican popular culture which is predominantly Afro-Caribbean. I credit Teju with awakening my now abiding interest in Caribbean, and in particular Jamaican, popular culture by introducing me to the relatively new field then, of Cultural Studies. Having studied English Honours at Lady Shri Ram College and Sociology at Jawaharlal Nehru University in the 70s followed by Journalism at the University of Kansas, and even a foray into visual art, I had found myself rudderless. Neither English Literature nor Sociology really enthused me; it wasn’t until that fortuitous encounter with Cultural Studies that I began to feel an interest in matters intellectual again. Having wandered through several different ‘disciplines’ as I had, I was excited to find new ways of thinking and writing that synthesized my different areas of knowledge. Of course this was something that JNU’s multi-disciplinary approach to scholarship had also prepared me for. In 1995 I started writing a weekly column in a Jamaican newspaper while working at the University of the West Indies in scholarly publishing. I named my column ‘Hyphen’ to signal my lifelong feeling of ‘in-betweenity’, of being formed between cultures in an India that was rapidly modernizing, producing tectonic cultural shifts not always easy to navigate. Born and brought up a Syrian Christian, albeit by liberal parents, I always felt envious of my Hindu friends, especially the numerous rituals and festivals they could lay claim to. There was also a sense of feeling illegitimate, especially since I grew up in Ahmedabad, not Kerala, where I wouldn’t have been as out of place. There is something profoundly destabilizing about watching your mother carefully crow-proof fishbones and other scraps of our non-vegetarian meals in secure little packets before consigning them to the garbage can in case rapacious birds outed us in front of our finicky vegetarian Gujarati neighbours, forcing us to leave the community in disgrace. There is also a deep discomfort in feeling disconnected from the vernacular culture around you because your father thought English was the only language you needed to know. Not being allowed to go to Hindi movies like all my friends did produced yet more alienation; by the time I reached my teens I felt like a classic misfit, like someone looking at the world through an impervious bubble. It wasn’t till I came to Jamaica in 1988, after sojourns in the United States and Brazil that I started to feel at home, leading me to settle down here. Here was a vibrant, vernacular culture I could be part of. Jamaica is also the most welcoming society I’ve ever come across.